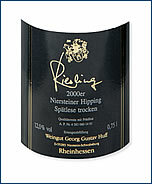 Riesling in its various incarnations is to many connoisseurs the indisputable King of Wines. And where can it be found at its peak but in its cradle – Germany – where it is thought to have descended from the original vine of the forests, vitis silvestris. The vine itself is vigorous, having a good resistance to frost and extreme cold. And, as in other wine regions of northern middle Europe such as Alsace and Bohemia, it is absolutely indispensable for the production of quality white wines. At its best, principally around the Rhine and Mosel rivers, the Riesling gives steely wines with high acidity and an aroma highly reminiscent of minerals and petroleum. Late-harvest wines are packed with spiciness and have bags of ageing potential, the best being able to look forward to several decades in the owner’s cellar. 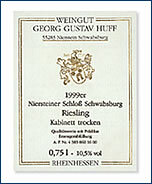 Representative samples to be found in the Czech Republic are from Weingut Georg Huff, a family winery in the picturesque village of Schwabsburg, not far from the famous wine town of Nierstein. 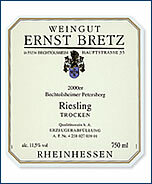 Also in the Rhine valley is Weingut Ernst Bretz from Bechtolsheim, in the heart of the Rheinhessen wine region. This is another family outfit which has been producing wine since 1721, specializing in such types as trockenbeerenauslese and eiswein. 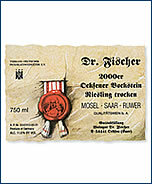 From the Mosel-Saar-Ruwer region we have Dr. Fischer of Ockfen, an estate now managed by the said doctor’s daughter. 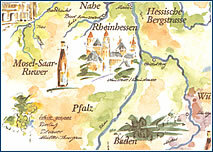 Wines from the Saar are super-light in alcohol and notable for their steely character topped by refreshing tones of zippy fruit. It is worth noting that German wine labels are nowhere near as hard to decipher as all those long and unpenetrable words may suggest. Right at the top comes the name of one of the country’s thirteen designated wine regions. Below the picture appear the town and vineyard where the grapes are grown, followed by the grape variety and quality level. The Zyllis gift package is a suitable present for almost anyone who likes wines. 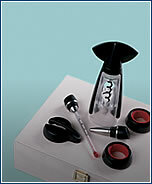 The nicely designed set includes a foil cutter, cork screw, thermometer, stopper and rings to prevent the wine from dripping down the side of the bottle. Price: CZK 2,175. Available from: La Vecchia Bottega, OC Nový Smíchov, Plzeňská 8, Praha 5. The Prague Wine Society and Pasha restaurant will be holding a Lebanese wine and food tasting on Monday, 29th July 2002 at 7pm. More info on tel: 5753 2434 or at www.pasha.cz. Is wonderfully fragrant, with citrus fruits mingling with linden flowers plus a typical whiff of petrol on the nose and with an elegant, full and round palate. Available from: Galerie vín a vinný sklep, KC Beroun. From this boutique family winery, it displays a fine bouquet with a harmonious, complex taste and lovely zesty finish. Good aging potential! This pale sample with a typical mineral nose along with hints of boiled sweets is crisp, pleasantly drinkable and food-friendly. Available from: Vinotéka Modrý domeček, Vítova 8, Dobřichovice. This one comes from the Saar valley and is pale with lush apple (Granny Smith) and citrus fruit with a hint of petrol developing, oily, slatey and very crisp and light.